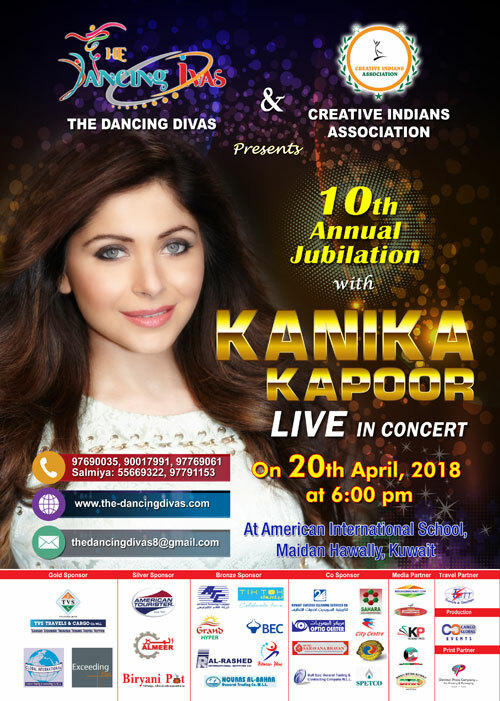 The star singer Kanika Kapoor, who crooned her way into the hearts of millions of music lovers with the popular song Baby Doll will be performing live in concert in Kuwait for the 10th Annual Jubilation of The Dancing Divas Academy on 20th April 2018 at the American International School. Kanika Kapoor is the new age Indian playback singer. Her performances ranges from contemporary Bollywood to Sufi, bhangra and western. The Baby Doll song went viral and Kanika also won a Filmfare award. The gorgeous singer has made a name for herself with peppy chartbusters and subsequently earned widespread recognition and success for singing one of the Hindi cinema's top charted songs, including "Lovely" and "Kamlee" for the film Happy New Year, "Chittiyaan Kalaiyaan" for the film Roy, "Desi Look" for the film Ek Paheli Leela, "Nachan Farrate" for the film All Is Well, "Jugni Peeke Tight Hai" for the film Kis Kisko Pyaar Karoon, "Jab Chaye Tera Jadoo" for the film Main Aur Charles, "Neendein Khul Jaati Hain" for the film Hate Story 3, "Premika" for the film Dilwale, the later of these rank among one of the highest-grossing Bollywood film. The song "Da Da Dasse" from the film Udta Punjab, earned her several Best Playback Singer. She also most recently hit the news for her performance at the Buckingham Palace in London where she performed for Prince Charles and wife Camilla, Duchess of Cornwall. A powerful performer, Kanika promises to be a treat for music lovers in Kuwait. Mixed with feet stomping performances by The Dancing Divas Academy, Kuwait popular academy, Kanika Kapoor Live in Concert is just the right show to kick off the hot summers in Kuwait.